(October 2, 2012 – New York, NY) We are proud to announce that the La Jolla Playhouse production of the new American musical HANDS ON A HARDBODY will open Thursday, March 21, 2013 at Broadway’s Brooks Atkinson Theatre (256 West 47th Street), following a preview period that begins Saturday, February 23, 2013. Ticket information will be announced shortly. The Broadway production will feature the full cast from the La Jolla Playhouse engagement: Keith Carradine (Tony Award® nominee, The Will Rogers Follies), Allison Case (Hair), Hunter Foster (Tony Award® nominee, Little Shop of Horrors), Jay Armstrong Johnson (Catch Me If You Can), David Larsen (American Idiot), Jacob Ming-Trent(Shrek The Musical), Kathleen Elizabeth Monteleone (Tales of the City), Mary Gordon Murray (Into The Woods),Jim Newman (Curtains), Connie Ray (Next Fall), Jon Rua (In The Heights), Keala Settle (Priscilla Queen of the Desert), Dale Soules (Hair), Scott Wakefield (Ring of Fire), and William Youmans (Wicked). Inspired by true events and based on the acclaimed 1997 documentary of the same name that was created by S.R. Bindler and produced by Bindler and Kevin Morris, the musical features a book by Doug Wright (Pulitzer Prize winner, I Am My Own Wife), lyrics by Amanda Green (Bring It On: The Musical), music by Trey Anastasio (Phish) and Amanda Green, direction by Neil Pepe (Broadway’s Speed-The-Plow), and musical staging by Sergio Trujillo (Memphis, Jersey Boys). The world premiere production of HANDS ON A HARDBODY opened Saturday, May 12, 2012 at La Jolla Playhouse and played a limited engagement there through Sunday, June 17, 2012. HANDS ON A HARDBODY also boasts an award-winning design team including scenic design by Tony Award®winner Christine Jones (American Idiot), costume design by Tony Award® winner Susan Hilferty (Wicked), lighting design by Tony Award® winner Kevin Adams (Spring Awakening), sound design by Tony Award® winner Steve Canyon Kennedy (Jersey Boys), orchestrations by Trey Anastasio, and vocal arrangements/musical direction byCarmel Dean (American Idiot). Click here to view bios for all cast and creative team members. For ten hard-luck Texans, a new lease on life is so close they can touch it. Under a scorching sun for days on end, armed with nothing but hope, humor and ambition, they’ll fight to keep at least one hand on a brand new truck in order to win it. In the hilarious, hard-fought contest that is HANDS ON A HARDBODY only one winner can drive away with the American Dream. The world premiere production of HANDS ON A HARDBODY opened Saturday, May 12 at La Jolla Playhouse and played a limited engagement through Sunday, June 17. 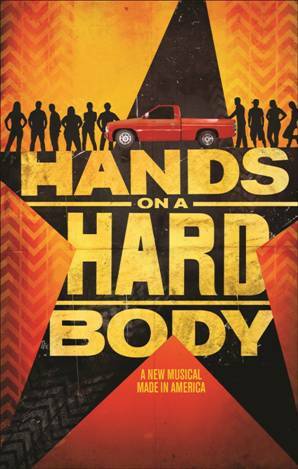 HANDS ON A HARDBODY was commissioned by La Jolla Playhouse (Christopher Ashley, Artistic Director & Michael S. Rosenberg, Managing Director).